Children's book week is an annual celebration of reading for pleasure for children and this year it runs from 7th - 11th October. I know from friends with children (older than E) that schools and libraries hold events but I didn't know much more, other than that it was to encourage children to read for pleasure. If you want to find out more, the Book Trust website is packed full of information. I've been reading to E since I was approximately 4-5 months pregnant. Not always on a regular basis, admittedly, but I'm pleased that it looks as though she'll be a book lover, even from this young age. Despite hardly ever getting time to do it myself, reading is something that I enjoy and think is important in life so I was always determined that my children would be good readers. Admittedly it is now harder to hold her attention - but since she's been walking, that's the same with many things (she's far too busy exploring and causing mischief to sit still!). Whether we're sat in the living room or bedroom, the TV is off as is anything else that might distract E.
E sits on my lap and will help me hold the book and turn the pages. We quite often don't follow all the words, we look at the pictures and I point different things out to her and talk about what they are doing, the colours etc. We have quite a lot of noisy books and books with lots of lift up flaps. These are great for grabbing her attention! I make up silly voices and make loud, over the top noises for different things which helps keep E amused. As soon as E loses interest, we stop. I don't want to force her into reading otherwise she'll see it as a chore. Because of this we often just pick up/put down books and open them at any page. If I'm reading from a magazine or the newspaper and she starts grabbing at it, I try to read some of it to her too.... before she loses interest again! As you might guess, I'm a big fan of books by Janet and Allan Ahlberg, they were some of my favourites when I was a child. 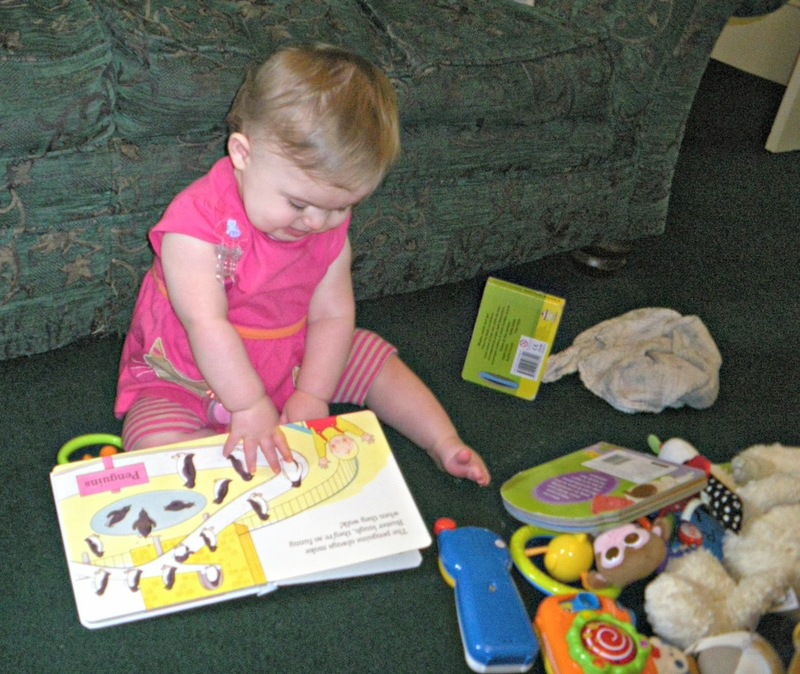 How old were your children when you started to read to them? Do you have any childhood favourites that you share with them? Leave a comment, I'd love to hear from you.